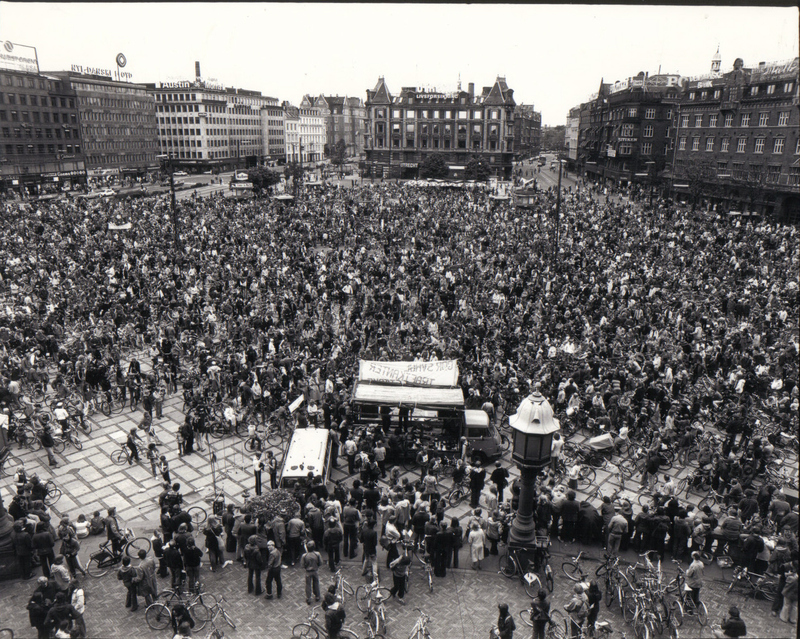 During the first half of the century, the bicycle became more and more popular in Denmark. In 1890, there where app. 3,000 bicycles in Copenhagen. In 1900, the number had increased to more than 30,000. Seven years later, there were 80,000, and in 1934 there were app. 400,000 bicycles in Copenhagen. The Danish Cyclists’ Federation was founded in 1905 and is the oldest cyclist organisation in Europe with the primary goal to make the authorities improve conditions for cyclists. In the beginning, there was hardly any regulation of traffic. Not until 1910 were give way rules introduced in the Copenhagen Police Regulations. In 1923, the Parliament passed the first proper Road Traffic Act. 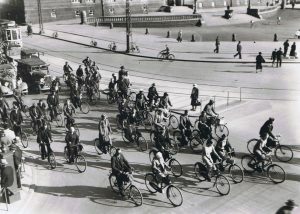 In the 1920s and 1930s, bicycles and trams dominated the streets in the larger cities, and they developed accordingly. All urban functions were located within dense structures, keeping transport distances to a minimum. At the same time, bicycles became enormously popular as a means of transport for Sunday outings and holidays. During the German occupation of Denmark from 1940 to 1945, a shortage of supply and fuel rationings meant that the bicycle became the dominant means of transport. It continued to be so until the mid 1950s when car traffic began to grow rapidly. The growth of car traffic coincided with significant decrease in bicycling traffic until the mid 1970s. 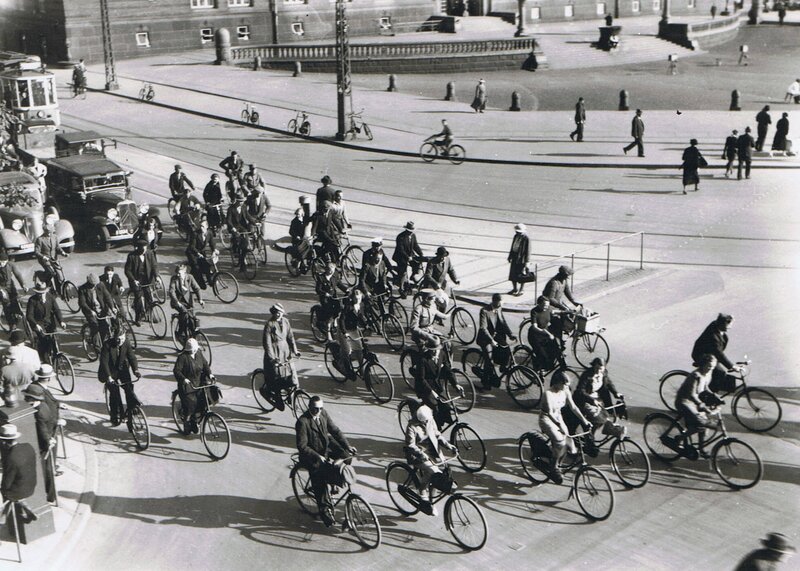 But even when bicycle traffic was at its lowest ebb, one third of the adult population were using bicycles regularly. The energy crisis of the 1970s and growing environmental awareness led to traffic switching from cars to bicycles and public transport and to an increasing demand for improved conditions for cyclists. 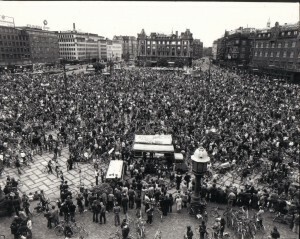 An example of this was the annual cyclist demonstrations in the major cities from the late 1970s. Authorities and planners became aware of the problems which cyclist faced, and bicycle traffic began to form a greater part of traffic planning. From 1982 to 2001, every budget contained funds allocated to the construction of cycle paths and improvements of conditions for cyclists. The focus on bicyclists and the funding were minimised after 2001 at the national level. This has now changed, however. Reducing CO2 emissions and improving health conditions have once again placed cycling on the political agenda.